“Every Freak For Himself” is, at this writing, 25 years old. What I thought was a worldly and knowing perspective at the time now reveals itself to be pure youth and (relative) innocence. Even the three songs about murderers are told from fantastical and cartoonish perspectives. The rest is all youthful optimism and spell-casting: Maybe we CAN all be stars, maybe life will be magical, if we want it bad enough. If we all focus hard enough on the same illusion, we can make it come true. First and foremost, Koo-Koo Boy was a love letter to all the objects of my obsession. Sixties Pop and Eighties New Wave, Debbie Harry and Blondie, serial killers (a nod to my mother’s penchant for true-crime reading), comic strips, toys and the world at large—as rendered through a perpetual 12-year old’s narrow but vivid perspective. Dan was obsessed with Buddy Holly, The Romantics, and Elvis Costello, among others. Those things all filtered down into the music we made together. It was also about friendship. The environment that brought Koo-Koo Boy into being was all about friends. People who liked each other and were creative, where forming bands was the logical “treehouse” to build. Let’s form a band! Let’s go see each other’s bands! Let me take pictures of your band! Let’s make a fanzine! Can my band open for your band? Let’s get the Locomotion Poetry people involved! Can we ask Effie—the 80-year old vaudeville comedienne—to open for us? There was a lot of cross-pollination going on. We started with “Life is Very Meaningful” because it was so short and easy. It’s not even really a song. It’s more like a mantra that seems to refute its own message. (HOW is it meaningful? Does just SAYING it’s meaningful over and over prove it to be so?) It kind of sets the tone for an album on which there ARE no deep meanings. But deep meanings and real sentiments are two different things. There’s a lot of real sentiment here. So much so that I can cry listening to it now. Maybe it’s the sense-memories it awakens. It was such a happy, simple, fun time, and everybody seemed to love each other so much. It really was a charmed period. I knew even while it was still happening that the bubble would have to eventually break, and tried for that very reason to generate as much buzz and momentum as possible. I wanted that train to be going so fast that no one would be able to jump off! “Quick! Let’s record another album! Let’s make a video! Let’s book another show!" When I first heard the playbacks of “He Lives Alone” and “The Girls”—I realized Dan had done more than just arrange, play and record my songs well. The recordings were living, breathing things. They had a life to them. Simple as they were, they created sonic environments and little worlds of their own. I listened as if it was by some new band I was discovering—like it wasn’t us. And I thought, “I would totally be a fan of this!” He had worked some alchemy on my demos (all written on a Casio keyboard and all of which sounded—in demo form— somewhat like catchy carousel music). Without actually re-writing the songs, he had brought them to life just as I heard them in my head. And because I had a tendency to get locked into the same time signatures, he further differentiated one tune from another with rhythm (reggae in “Cooking For One”, a sort of robotic lock-step for “Deep Silent Night”, a kind of menacing shuffle for “He Lives Alone”) so that by the end, all 11 songs sounded markedly different from each other, without losing the cohesiveness of an “album”. Beyond our great friendship which was the soul of Koo-Koo Boy, we had the immediate benefit of the Dogs Life “umbrella”. Because we were all great friends and shared Dan, making us a kind of spin-off project, their fans all welcomed us, descending upon our first shows en masse. As a result, we enjoyed instant success without really having to pay any dues. Our two bands played together and influenced each other—I know I was influenced, anyway, by Lee Chabowski’s insanely catchy story-songs and cartoony vision, Dave Snyder’s gorgeous voice singing “baby-baby-baby-baby-babeee, I’ll meet you at the BEACH!” and his signature, trilling “whoah-whoah-whoah-s”... Bassist Amy Brown was everybody’s friend and favorite person, with her infectious smile and warmth. With their penchant for having stage guests and making their fans part of the show, their concerts were happenings. I loved all of that, and I wanted to create the same kind of love-fest at ours. Koo-Koo Boy owes a great debt to them all, spiritually and creatively. 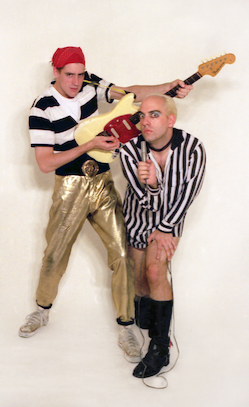 Even the name Koo-Koo Boy, suggested by J. Reto (still my best friend and soulmate) came from yet another friend—Rich Check (aka Wiggly Fred, later of Trap Door fame), a Pennsylvanian multi-media artist and personality. Check had created a comic strip about a man with a fly’s leg and a perpetual hard-on named Koo-Koo Boy. It always ended with “Koo-Koo Boy saves the world and goes to bed.” Check was another big influence, with his quirky non-sequiturs and trademark creative Tourette's. I’m not sure I would have felt free enough to do Koo-Koo Boy the way I did it, had it not been for Rich’s early example and gloriously unbridled vision. My sisters, both creative and hilarious, further influenced Koo-Koo Boy's humor and style, with Cynthia my eldest, even moonlighting as our keyboardist for a handful of gigs as “Miss Marble”—a Hollywood starlet in the Harlow vein, who mostly sat still without playing, photographed herself, and threw autographed headshots into the crowd like a manifestation of my own alter ego. Kelly appeared once as a flapper, modeling a dress called “The Shift” as we played the Beach Boys’ song of the same name (accompanied by The Salamanders), and provided endless (and enthusiastic) moral support throughout the years. And finally, the aforementioned J. Reto contributed immeasurably, from picking the name to the outfit I wore, filming videos, writing the lyrics to “Do The Cyclone”, making picture sleeve artwork and even a comic book starring us and the Record Time All-Stars (a 7” insert on a split-single). And so many more crazy and wonderful things. He gave great advice, which I always took, and for that, he was in many ways “the man behind the curtain”, our secret style guru. We were also the beneficiaries of many supportive radio folk who gave us early chances to play live on the air (Dave Kostek at WITR’s Rochester Sessions, John Giado at WBER’s Uncle Kong’s Thud Factory) as well as journalists (HB Ward from City Newspaper, Jeff Spevak from the Democrat & Chronicle), and even some TV coverage (Brother Wease’s Live Circus in 1992, Sally Cohen for GRC-9 when we competed in 1995’s Battle of the Bands). I can’t think of Koo-Koo Boy without seeing the face of John Ohler, a super-fan who became a super-friend. He came to every show, hollered and jumped up and down, and he knew every word to every song. He told me once that when he was going through a painful divorce, he listened to our second cassette “We Are A Star!” over and over, and said it saved his life. That’s probably the nicest thing anyone ever said to me about my music, and John also had a big, generous, loving heart. When he passed away from a motorcycle accident in 1997, he left a void I still feel. I miss you, John. This record’s for you, because you would have loved it best. And to Mom and my beloved Marcon, both now gone, I wish you could have been there. Every band has something different at it’s core. For us, friends really were the center of our Charms Blow Pop. Even our “fans” were friends, or people who BECAME friends, and they are too numerous to name here. But I tried to make as many of them a part of Koo-Koo Boy as I could. Without their playful hearts, and willingness to climb into the sandbox, it would all have been just a vanity project. I love them all, to this day and with my whole heart. They made it real. A true collaboration.